Meadmaking Workshop was a Great Success! 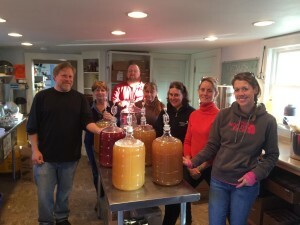 Today’s meadmaking workshop at The Honey Exchange in Portland was a great success. We rescheduled the date, and on the new date it sold out so quickly I didn’t even get a chance to publicize it here. There are six new meadmakers in the world as of today! 6 new meadmakers in the world, with your humble webmaster in the background. One of the nice things about working with the Honey Exchange is that they stock a large assortment of varietal honeys; you can tell by the different colors of each batch here. One gentlemen made a raspberry mead with some raspberries he brought, everyone else made a traditional mead…. but they all look different! It was a full house today, with all 6 attendees making mead. Sadly we had to turn a few people away for lack of space…. which of course gives us some solid motivation to have another workshop soon. Watch this space, it could be as soon as January 2015. 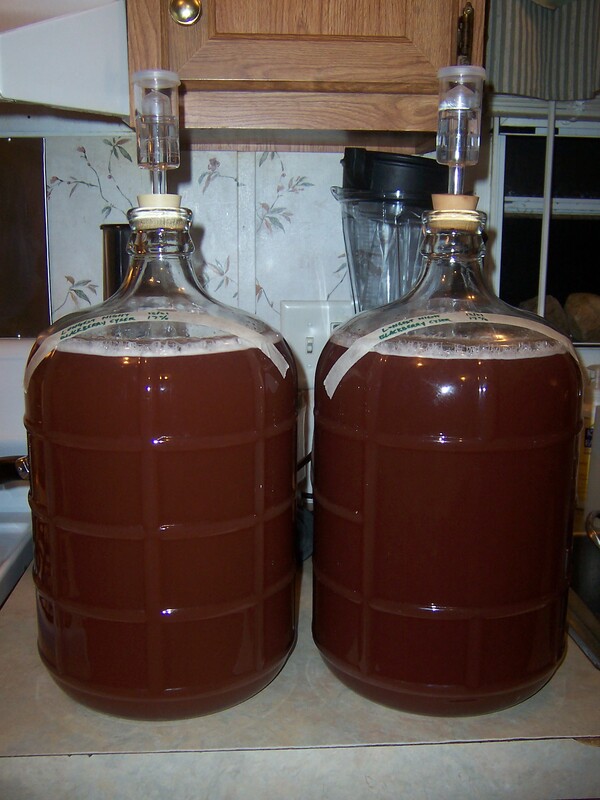 2014 has been a slower year for meadmaking for me. There are a variety of reasons for this, and it’s OK. One of the issues is storage space…. I have to have physical space to store all the bottled mead I am aging! But, it’s harvest time. This means berries in my part of the world. I got 2 quarts of lovely raspberries from a friend who had them growing, and my wife and I (mostly my wife) spent all summer picking blackberries as they were ripe from our property in the woods. 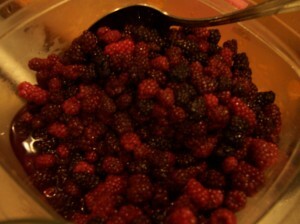 So this time, I did 2 batches: Raspberry Harvest and Blackberry Harvest. A chaga decoction and staghorn sumac infusion. This tea is richly colored and looks like coffee. 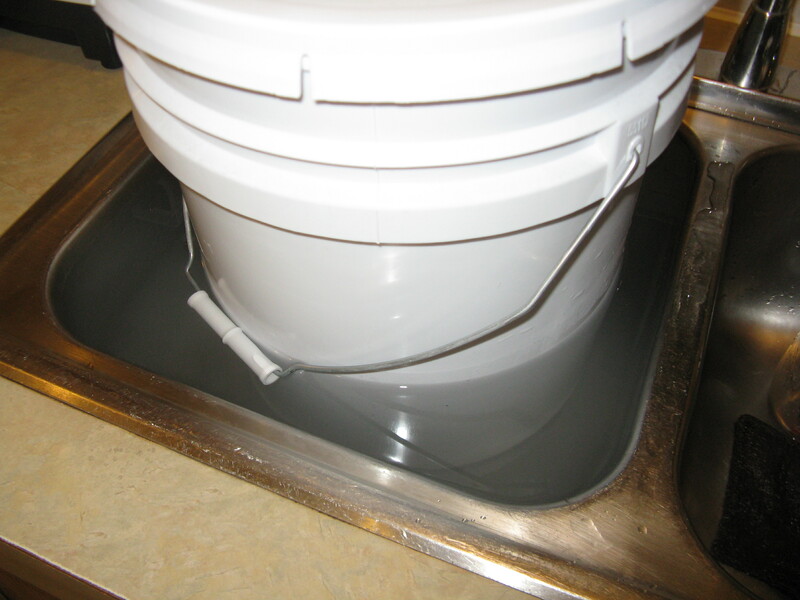 A 5 gallon bucket of crystallized/solidified honey, resting inside a sinkfull of hot water to help liquefy the honey. 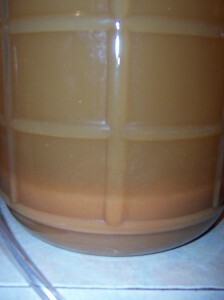 Even still, tonight’s meadmaking was much more labor intensive to get the solid honey to melt and dissolve easily. Once the honey was softer, I was ready to go. 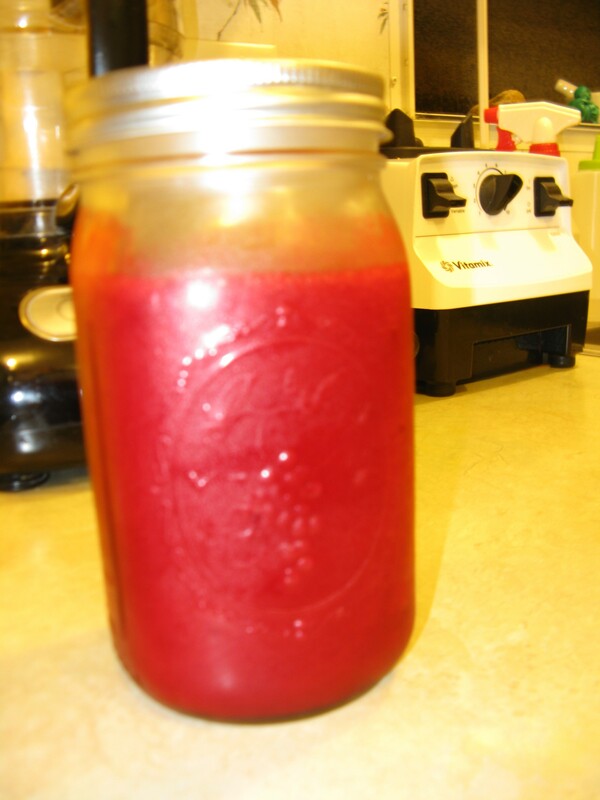 2 quarts of fresh raspberries makes about 1 quart of juice. Gorgeous! 17.5% initial alcohol potential for the raspberry mead. I can’t wait to see how this one comes out! I haven’t made a raspberry mead since the Raspberry Damiana Mead from 2011! 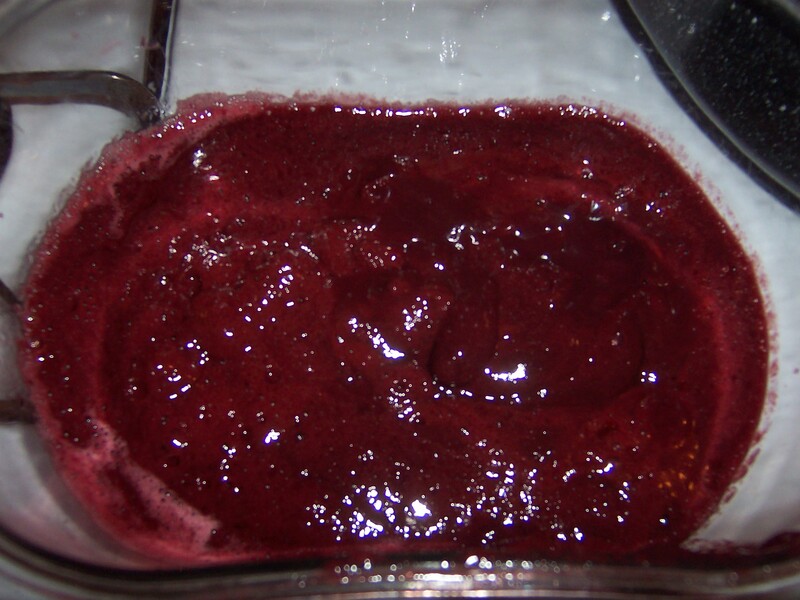 These raspberries had a wonderful tartness to them, that should translate well into a semisweet or a sweet mead. 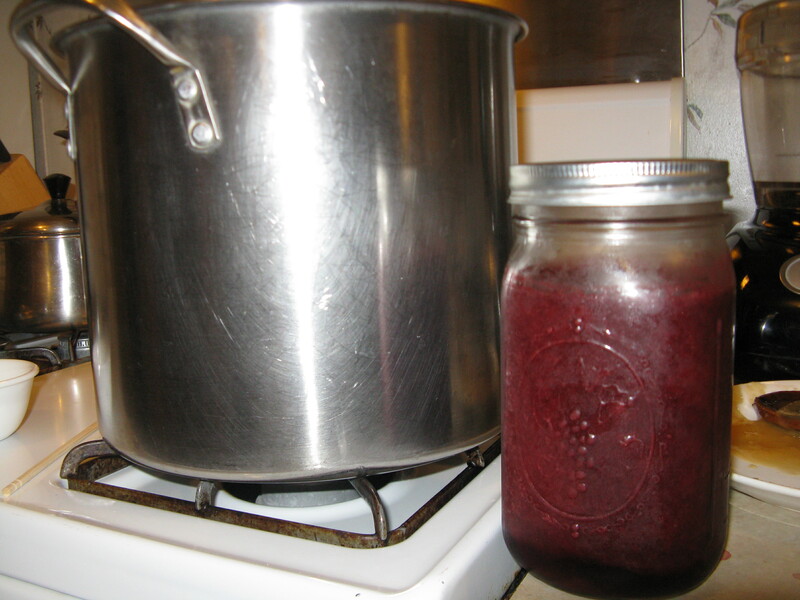 A quart jar of fresh blackberry juice next to my 3 gallon pot. A 17.5% initial alcohol potential for the Blackberry Mead. 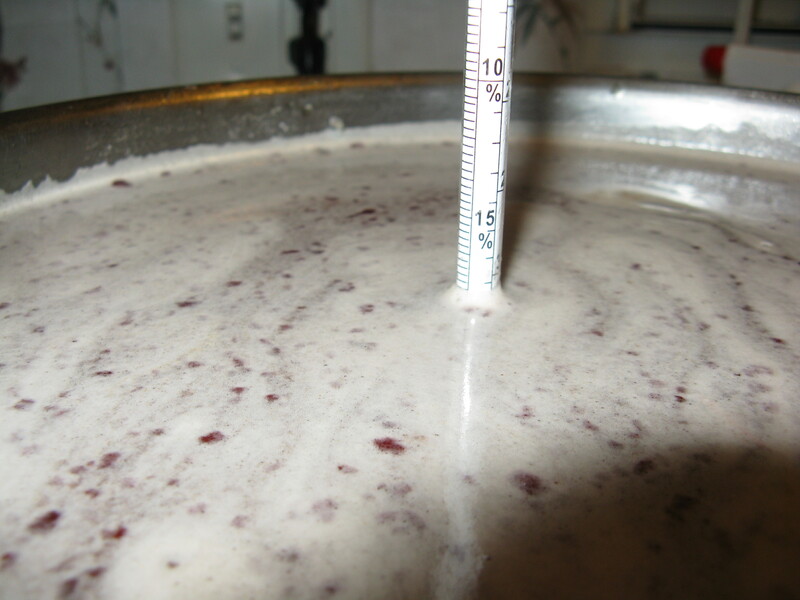 Similarly, I haven’t made a Blackberry Mead that wasn’t a cyser since 2010! 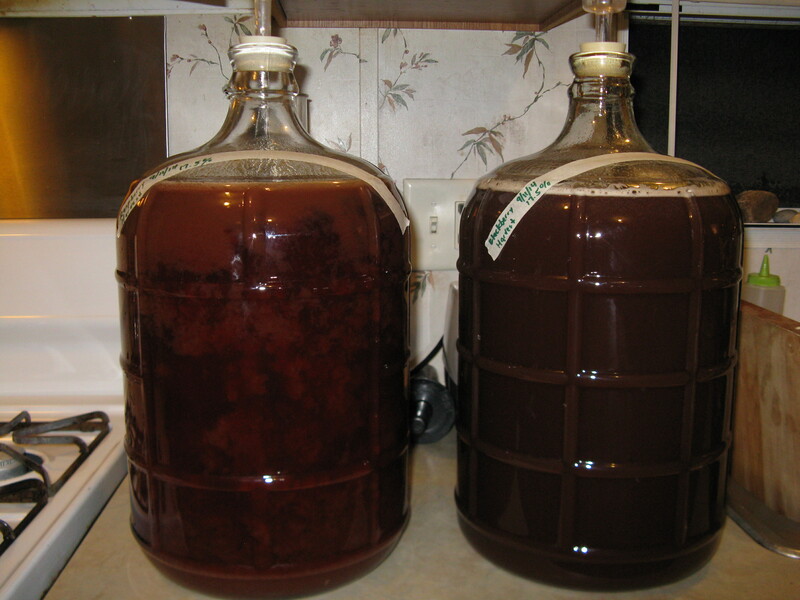 Raspberry Mead on the left, and Blackberry Mead on the right! I can’t wait to see — and taste — how these come out! I finally racked these meads tonight. They are both delicious, and sweet, coming in at about 14.5% ABV with 3% remaining alcohol potential. The Raspberry Harvest has more overt fruit flavor, probably because raspberries have a more intense flavor than blackberries. The Blackberry Harvest is smoother at the moment. The color of the Raspberry is more vibrant as well, which isn’t a huge surprise. I can’t wait to see how they age! It goes without saying that springtime is a season of rebirth. We are right at the end of this year’s spring thaw; there is still some snow on the ground (that actually came in quite handy today), and the mud is starting to harden up. The onset of spring is particularly evident to a gardener, to one who works with the Earth in its fecundity to sustain the family and the tribe. My Uncle John was a gardener (among many other things). Uncle John passed away this morning (while the chaga sap decoction was simmering on the stove), and I’ve named today’s mead after him. 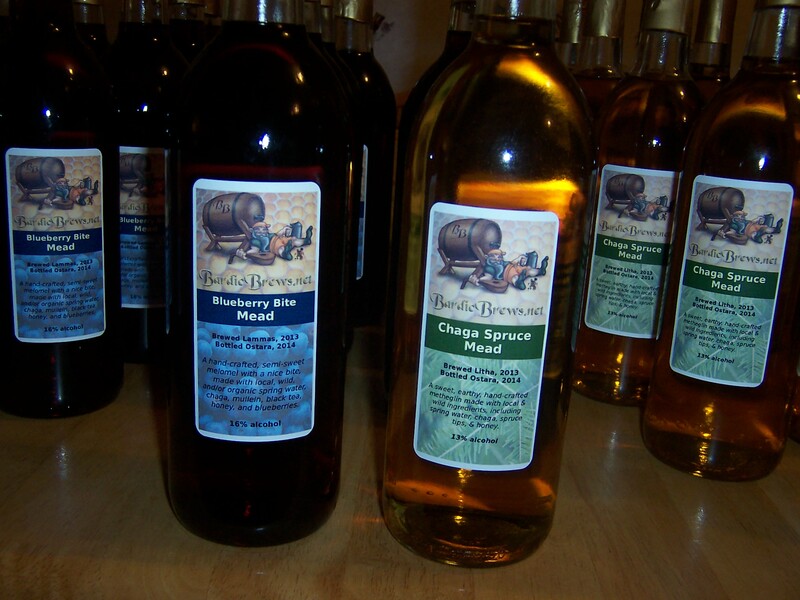 Mead is a bridge to the past and the future. 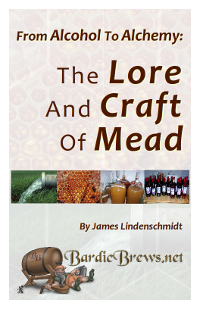 Humans have been making mead as far back in history as we can see, and a bottle of mead preserves its ingredients for posterity and future nourishment. Today, as I make mead, I am thinking of John. He was a good man, a beacon of kindness in his family and his community. Today my heart is with him, with my family, and with those who loved him. Hail! It is sap season here in Maine, so I’m going to start with several gallons of freshly harvested maple sap from one of my wife’s coworkers who lives nearby. Apart from using sap instead of spring water, I am more or less replicating what has become my favorite mead recipe, Mad Trad D.
I mixed in enough of the new bucket of Maine Wildflower 2013 honey I picked up recently to get to 18% alcohol. 2013 was a tough year for Maine apiaries, but this honey is fantastic. Some honey has an overtone of tartness to it, but this honey is much smoother than that, reminding me of smoke & caramel. Then I mixed up the second batch to 18%, and poured it into the 2 carboys to top them off. The must (sugary liquid that will become mead) tasted fabulous, almost like a syrup. This should make an outstanding mead, which is no surprise. Uncle John was a great fermenter, and made the best pickles (cucumbers and onions) from the vegetables he’d grown himself. Therefore another fermentation dedicated to John is sure to come out spectacular. I look forward to some time in the coming years when I gather again with John’s branch of my family. 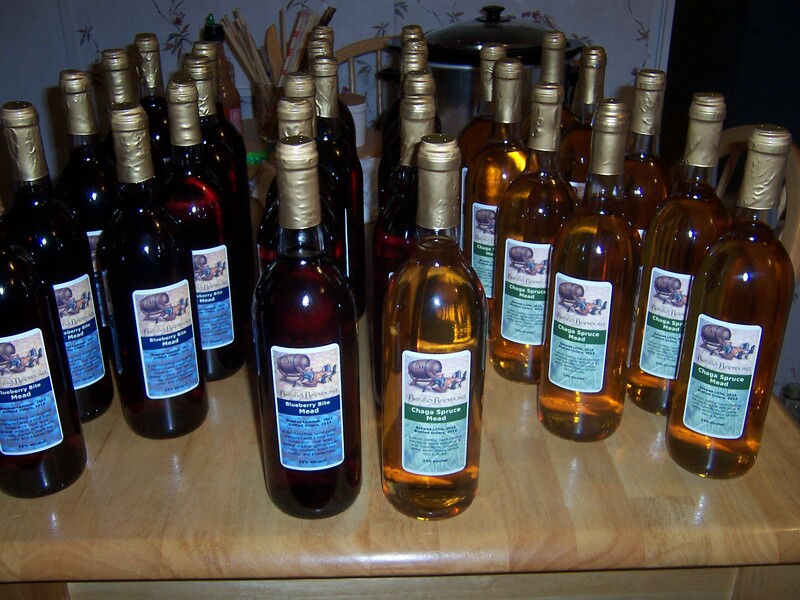 I will bring some of John’s Springtime Traditional Mead to share with them on that day, so that we can raise our glasses to John and remember him. Hail! 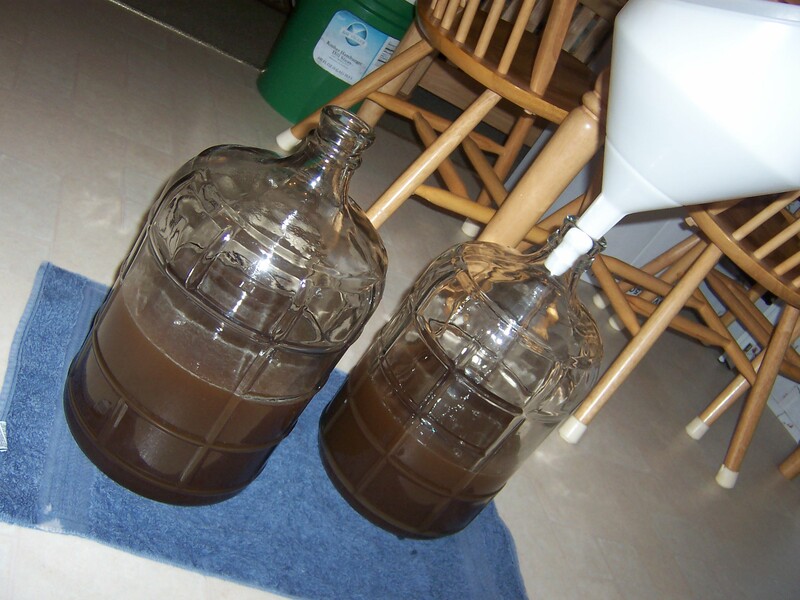 After these 2 batches had been sitting for several days, there still was no sign of fermentation; the airlock wasn’t moving at all and there were no tiny CO2 bubbles rising in the must. This is called a stuck fermentation, and it had never happened to me before! After doing some research, I am pretty certain that the fact that the sap I used was cloudy is the culprit. This indicates the presence of microorganisms in the sap, and most likely they were interfering with the normal yeast activity. 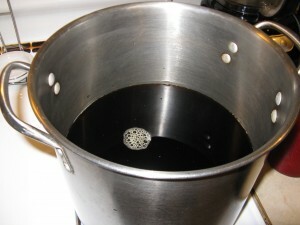 Cloudy sap is normally dealt with by cooking it down normally into maple syrup, where the cloudy sap produces Grade B Maple Syrup with its associated richer flavor reminiscent of caramel and molasses, and the presence of many more minerals. As my regular readers will know, I do not recommend boiling the honey-liquid, the “must,” but in this case there was little choice. I emptied one of the carboys back into my stockpot, carefully brought it to a boil to kill off any microorganisms (including the yeast I’d pitched), cooled it down to blood temperature, and put it back into the carboy with some new yeast. Voila! This morning it was bubbling away normally! Great news. Today I will take care of the other batch in the same way. I racked the mead today, and it came out at 3% alcohol potential, which means it’s 15% ABV and sweet. It has a maltier flavor to it, presumably from the fact that the mead was boiled. 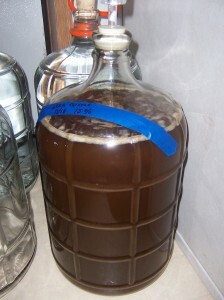 This mead is already quite clear, so I will be bottling it soon. It’s been a quiet winter; I took much of it off on somewhat of a sabbatical from social media and blogging. But mead continues in the background, and it was a bit overdue for time to bottle. 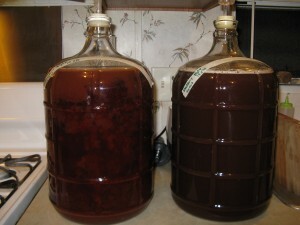 I had two delicious batches cleared up and ready to go: Chaga Spruce Mead and Blueberry Bite Mead. I had run out of bottles, and a snafu at a bottle supplier delayed me a bit, but finally I had everything in hand. One difference is that these days I’m paying the $0.50 per page to get the labels laser printed, which makes a big difference in the quality of the label. I’m grateful for this harvest, particularly in light of the bad year for honey in 2013. It’s not as available as it has been in the past, but I am hopeful 2014 will be a better year for the honeybees and those who care for them. New bottles means empty jugs, which means racking some of the other batches I have going. Watch this space for updates. Tonight is Yule, 2013, otherwise known as the winter solstice, which means it is the longest night of the year. On this night it is traditional for our ancestors to stay up all night, often in quiet contemplation, while awaiting the return of the light at dawn. In addition, where I live there is an ice storm coming. There isn’t much happening yet as I write this, but there is been a bit of rain most of the day, which will continue and get more intense as the temperature drops. By the time the storm is done on Monday we could have up to 1″ of ice coating everything outside. In short, a great night to make up some mead. I decided to take advantage of this settlement and I siphoned the clear(er) cider out of the carboy, leaving the sediment behind. 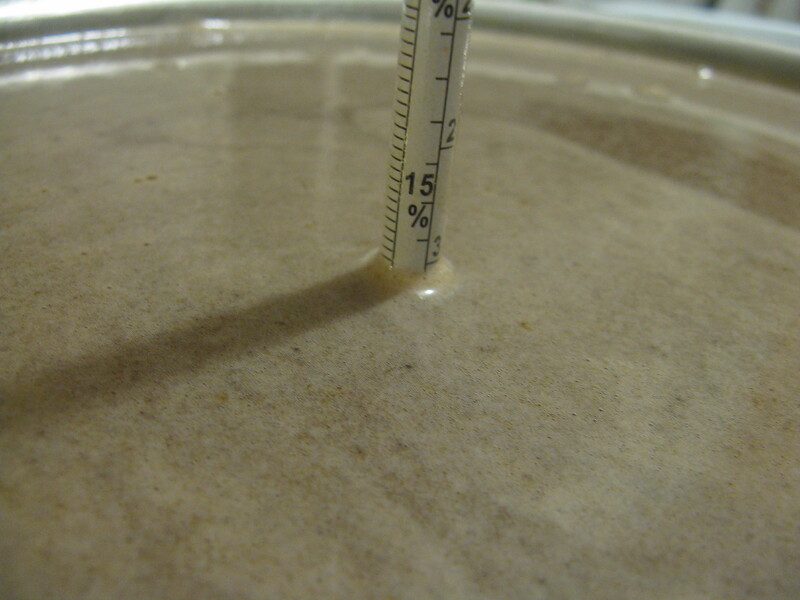 This way I should have a bit less sediment at the end of my mead fermentation. I mixed 2 batches of this cyser tonight, in 2 different 3-gallon carboys, one batch at a time using half of the ingredients. 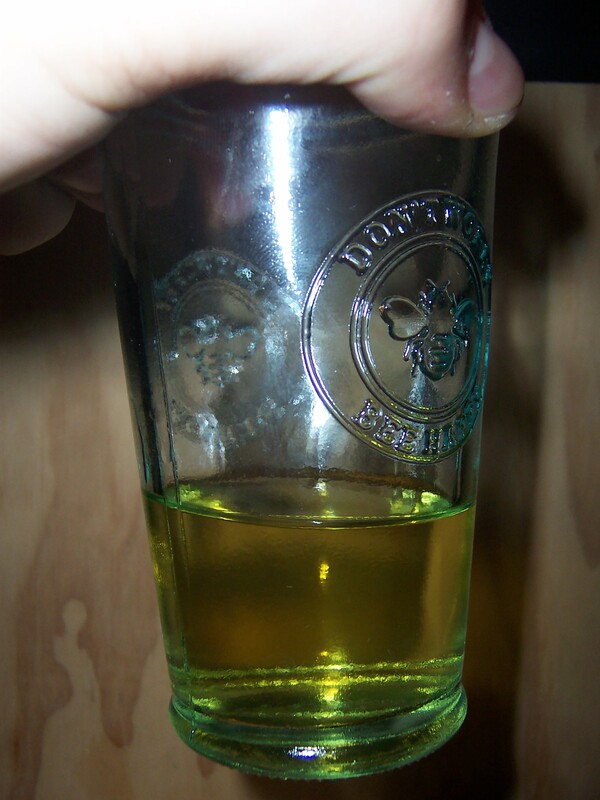 I ended up using about 1.25 gallons of cider, 0.75 gallons of Star Thistle Honey (I wrote about this fantastic honey in my previous post Star Thistle Mead), about 2 cups of black tea (for the tannins), topping it off with spring water to get me to three gallons, and a 17% initial alcohol potential. Lalvin RhÃ´ne 4600Â® was selected by Inter-RhÃ´ne’s technical department after three years of research.The purpose of the study was to select a strain, which would be particulary suited for the production of elegant and fruity white wines, but also being appropriate forÂ rosÃ© wines. Lalvin RhÃ´ne 4600Â® has the qualities required to successfully ferment musts with high sugar and low assimilable nitrogen contents, and a high alcohol tolerance.It enhances wine fruitiness with pineapple and apricot aromas. I can’t wait to see how this comes out with the new yeast and the tweaked recipe! The Mead Workshop yesterday at The Honey Exchange went very well! Most of the attendees were experienced beekeepers, and one of them brought his own honey from his hives to make his mead. That was great! Unfortunately I don’t have any photos of either the workshop itself or the batch of mead that I made. One of the things I stressed during the workshop is how lucky we are in the greater Portland community to have a resource like The Honey Exchange. By far, the biggest question I get from people contacting me about mead is “where do I get good honey?” With a resource like The Honey Exchange, who not only support local beekeepers with beekeeping supplies and extraction services, but also support the general public with a wide selection of varietal and artisan honeys and honey products — including a fine selection of commercial meads — it makes things a lot easier for those of us in this area. If you have any needs whatsoever related to honey or meads, go see Phil or Meghan at The Honey Exchange and they will take great care of you. I had looked forward to making my first batch with a varietal honey. I always use good quality local honey, but it’s usually a somewhat “typical” wildflower honey. It’s great honey and there is nothing wrong with it by any means, but it was a treat to broaden my honey palette with this batch of mead. The honey I ended up using comes from Sleeping Bear Farms in Michigan. Their Star Thistle Honey is gathered from the nectar of Star Thistle that only grow in northern Michigan in abundant quantities. It truly is locally produced for them, and ships out directly to Portland. Star Thistle is a non-native plant, but one that has significant benefit. Primarily, it grows and blooms at a time of the year when there is little forage for honey bees. This period typically occurs around the end of June, after clover has finished flowering, and lasts for about 6 weeks. This nectar collection is vital for the survival of the honey bees, as they are busy storing food for the upcoming winter. Star Thistle in Michigan is a fine example of how invasive species isn’t as cut & dry of an issue as we would think. Humans have so profoundly affected the ecosystems of the planet that I think the balance of nature will have to adjust. It is no surprise to me, then, that certain non-native plants thrive in an ecosystem like this. As far as the honey itself goes, Star Thistle Honey is fantastic. It is thicker, with a very mellow, floral, musky, flavor to it. It is lighter than what I am used to, unfamiliar to my palate, which is accustomed to sweeter and fruitier Maine honey. It’s delightful to work with, and I look forward to seeing how this mead turns out. I used the same Mad Trad D recipe I have been using, with a chaga/sumac decoction, and added enough honey to get to a 15% initial alcohol potential for a drier mead. So this mead will be a bit drier, and also the flavor profile of the honey should be different. Interesting to note that I did not go home immediately after the workshop, so the carboy spent about 8 hours in my car, in 30-40 degree temperatures. As such it is starting slowly. 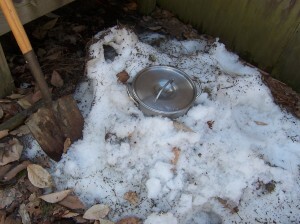 I will watch it carefully over the next 48 hours as it warms back up; I may even artificially add some heat to it. If I need to do anything technique-wise I will document it here. Star Thistle Mead. 15% Initial alcohol potential. As you can see the color is a bit darker than other traditional meads I’ve done with Maine Wildflower honey, but we’ll see how it settles out. Much of the dark color is due to the chaga, which does tend to fade as the mead progresses. Star Thistle Mead, freshly racked and already clear, dry, and delicious! I finally racked this version, now that I have some empty jugs after the recent bottling session. This mead is already mostly clear, and is delicious! It has 1% remaining alcohol potential, so it is quite dry, and is 14% ABV. 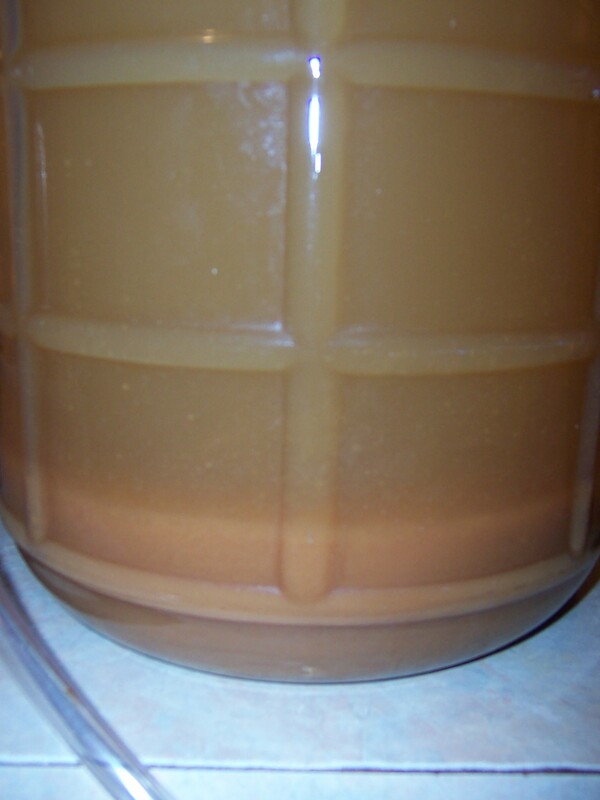 There is only a subtle hint of that young dry mead harshness, this is probably the best young dry mead I’ve done yet. It is quite drinkable already, and I’m sure it will just improve with age. It has a lovely almost tartness (sumac?) as well as a somewhat caramel-y overtone that lingers in the mouth, reminiscent of aged mead. I’m kind of blown away at how good this is already! 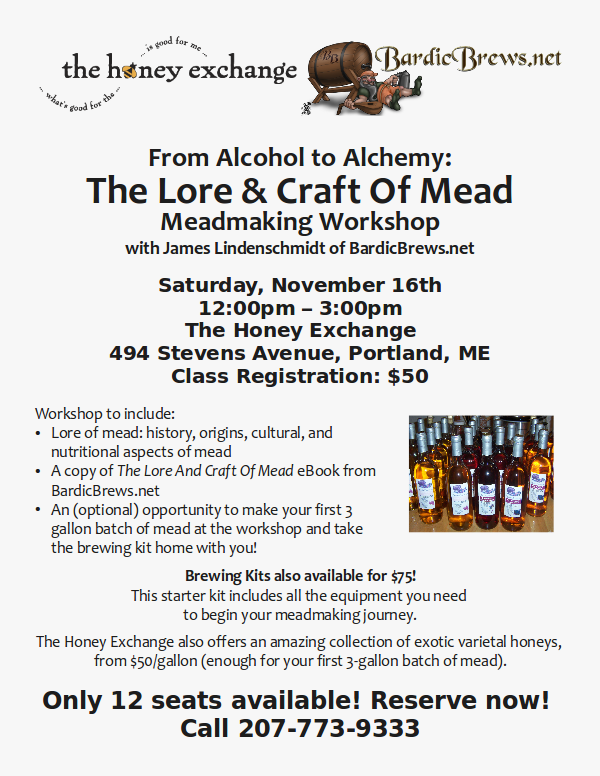 There are still a few seats left at the Meadmaking Workshop on Saturday, November 16th at The Honey Exchange in Portland, ME. I’m really looking forward to this event for a lot of reasons, but the main one is in working with all the incredible varietal honeys that they have available! I’ve always used high quality local honeys, but The Honey Exchange gives me (and you!) access to much more exotic honeys for use in fermentation. Registration for the workshop is $50. The (optional) brewing equipment kit is $75, and you can choose from the varietal honeys available. To reserve your spot, call Phil at The Honey Exchange at 207-773-9333. I’m excited to announce that my next meadmaking workshop is set up and ready to go in Portland, Maine on Saturday, November 16 at The Honey Exchange. The Honey Exchange is a fabulous resource for meadmakers in the area, because they offer a very wide variety of honey to use in our meads! You can get a base honey for about $50/gallon (this is enough to do a 3 gallon batch of very sweet honey), and they have more exotic varietal honeys available at various prices. 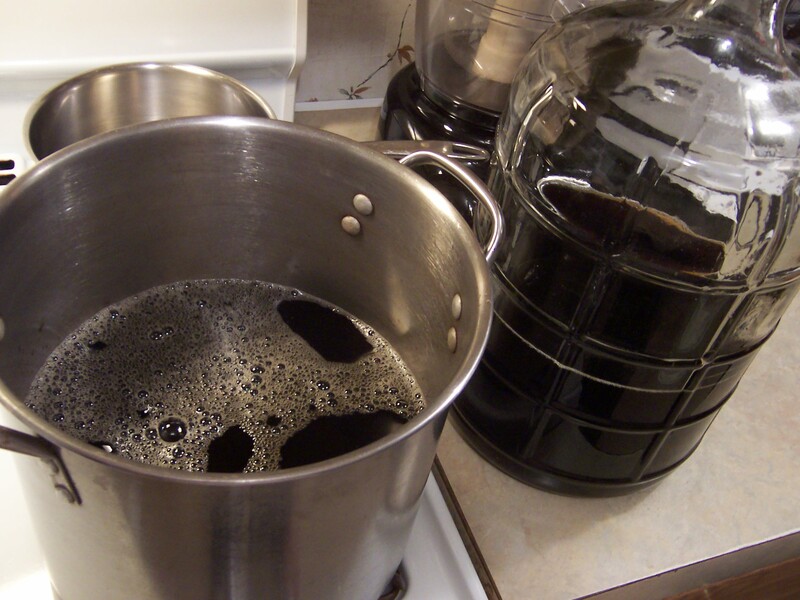 Registration for the workshop is $50, and you will also have an optional opportunity to brew your own batch of mead and take it (and all the equipment) home with you. The brewing equipment kit is $75, and you can choose from the varietal honeys available at The Honey Exchange. To reserve your spot, call Phil at The Honey Exchange at 207-773-9333.